Refinery29, a leading American digital media, and entertainment company asked Hydric to build an interactive glossary of terms relating to gender and sexual orientation. 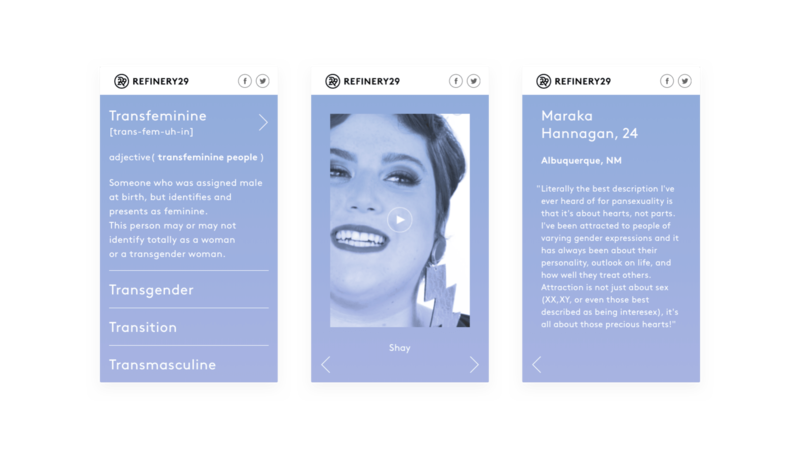 As well as providing formal definitions, Refinery29 asked real people to share interpretations of their identity, orientation, and experiences. Launching in honor of Transgender Awareness Week, the glossary was part of ‘Gender Nation’, Refinery29’s campaign to shed light on the LGBTQIA community. The goal of the glossary, in particular, was to help educate people on gender-related vocabulary, give a platform to individuals who identify with these oft-misunderstood terms and provide deeper insight into how people identify with and define these labels. Refinery29’s internal creative team handled the concept and design for the glossary, and it was Hydric's task to take their visuals and flesh them out to be responsive across all devices. Hydric then used ReactJS to build the web application and 'Contentful' as the Content Management System for this project. The Gender Nation glossary is a comprehensive list of gender-related and sexual orientation terms and their associated definitions. Select entries are also accompanied by video content from identifying individuals and personal stories and explanations submitted by other users. During the glossary’s launch week, if a user identified with any of the terminology they were also encouraged to share their story and personal definition of that word. Recognising that language, just like gender, can be fluid, any concepts missing from the glossary could also be submitted by individuals. The Gender Nation glossary launched in November 2017 during Transgender Awareness Week in association with GLAAD. In the coming months we’ll be sharing the impact of the Gender Nation project, so be sure to follow us on Twitter, LinkedIn or Facebook for updates.